An icon is reborn | What Car? We take Audi's 1 million Quattro concept car for a drive on the Californian coast. Audi Quattro. Even if your knowledge of cars extends no further than they have four wheels and an engine (usually) you'll have heard of it. The Audi Quattro was as much a feature of the 1980s as electro-pop and Joan Collins' shoulder pads. It also proved that four-wheel-drive was not just for farmers and soldiers; and went on to dominate some would say ruin international rallying. There are now quattro with a small q versions of every Audi bar the A1. Audi has often thought about doing another stand-alone quattro, and at the Paris motor show in September it revealed a concept version of what it might be. The fact that it marks the 30th anniversary of the original Quattro is largely coincidental work on it began in 2008 but was temporarily shelved in the aftermath of the banking collapse. Anyway, it owes more to the Sport quattro of 1983: short, light (the target weight is just 1300 kg, though it currently comes in at around 1340) and powered by a 2.5-litre turbocharged engine. It's based on the V8-engined RS5 coupe sort of. The similarities are a five-cylinder turbocharged engine and four-wheel drive, through the latest evolution of the quattro driveline. However, it's built around an aluminium skeleton, like the R8 and A8, rather than a welded steel body; its wheelbase has been shortened by 150mm, which demands that it's only a two-seater; and it's 40mm lower. Carbonfibre sections, including the bonnet, rear hatch, rear spoiler and some interior trim, help the weight-watching process. The direct-injection engine comes from the TT RS, but it has been modified to fit along the length of the car rather than across the engine bay, and here it develops 402bhp between 5400 and 6500rpm, with 355lb ft of torque from 1600 to 5300rpm. 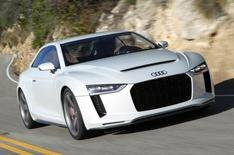 The gearbox is a six-speed manual, but a seven-speed twin-clutch S tronic could easily be accommodated, while the new mechanical quattro system is said to be smaller, lighter, faster to respond and more flexible than either of those Audi currently uses.